“Everyone needs a home,” says Jason Hartman. Research conducted over half a century ago by psychologist Abraham Maslow confirms that’s true. And it also demonstrates why rental real estate is a wise investment for public servants looking for a solid income stream. Maslow’s groundbreaking paper on human behavior and motivations proposed that people at different stages of development are ruled by different sets of needs and motivations – and that the basic needs such as food, safety and shelter must be met before any others. Rental property investing taps those basic needs. The need for safe shelter is essential among the majority of people in the United States and similar countries, and those who can’t purchase shelter must rent it. The housing collapse over the past few years saw record numbers of homeowners lose their houses to foreclosure and created another class of renters, joining the more typical renter groups of young professionals and those unable to buy property in the first place. Taken together, these groups outnumber homeowners in some areas of the country. Because of the demand for rental housing, rents are increasing too, creating opportunities to find good investment properties in many areas of the country – and for applying Commandments Six and Seven of Jason Hartman’s 10 Commandments of Successful Investing, which summarize the key principles of his approach. The sixth of these commandments, “Thou shalt diversify,” joins the seventh, “Thou shalt be Area Agnostic,” to express a key principle about investing in general, and in real estate in particular. Diversifying – investing in as many properties as possible, in a variety of markets –reduces risk and maximizes return. This approach offers some protection against the economic ups and down of both local and national economies and saves investors from putting all their proverbial eggs in the proverbial basket. The term, “Area Agnostic” points out the best way to diversify. Just as in the religious sense, an agnostic isn’t attached to a particular set of beliefs, preferring to keep an open mind about all possibilities, an “area agnostic” remains open to opportunities everywhere, not just in the local area. This attitude of openness also applies to the advisor an investor chooses to work with. The second of those 10 commandments states, “Thou shalt have a professional investment counselor.” Since an investor needs to find a qualified expert individual – not a company or a brokerage — who can guide the investing process, one factor in choosing that counselor is a willingness to be just as agnostic in terms of potential markets as you are. This avoids conflicts of interest and opens up more opportunities. As Maslow observed in the early 1940s, shelter is a basic human need. Everyone does, in fact, need a home. 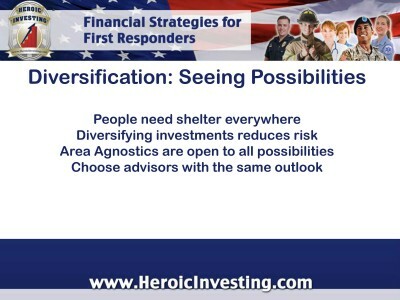 That’s one reason why diversification as an area agnostic opens up new investing opportunities in unexpected places.